Cards with female title fights on seem to be coming thick and fast in March with "G Legend 6" on March 3rd featuring 3 title bouts then, less than a week later, "Fighting Bee Vol 7" features another female title bout. The full show for "Fight Bee Vol 7" features 6 bouts in total though for us the obvious highlight is the title fight which pits Japan's former world champion Tenkai Tsunami against Japanese-based-Filipino puncher Honey Katsumata for the vacant OPBF female Bantamweight title. For Katsumata a win will supplant her on the world stage whilst a win for Tsunami could prove to be the next step for her to get another world title bout. We've got to say it's a great match up and the winner will hopefully get another big fight later this year. 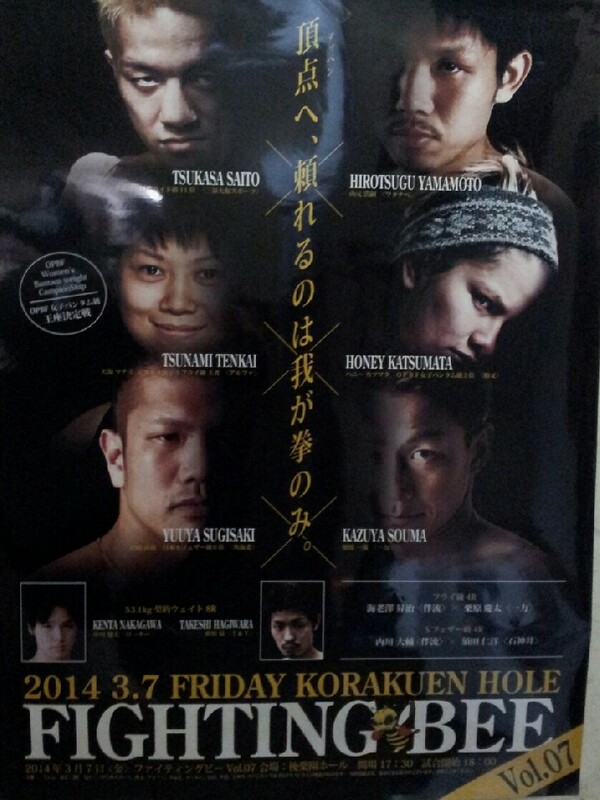 As for the poster, it shows not only the fighters involved in the Tsunami/Katsumata fight but also fighters from 3 of the other bouts on the show. It's nice enough and shows the head to head of several of the bouts but it's certainly not a poster that will really catch the attention if you walk past it. The poster does however have a notable spelling mistake on it, spelling the name of the venue as the "Korakuen Hole"...oops!